This is the 10th week of our Summer of Sci-Fi Challenge. To see the complete list of Summer of Sci-Fi books, click here. It probably wasn't entirely fair to Justina Robson that she had to follow Margaret Atwood in our Challenge. Atwood is a speculative fiction writer at the top of her craft, and I'm a lover of literary, artful prose, so any sci-fi novel would likely have paled in comparison to last week's Oryx and Crake. However, Robson is no slouch of a writer herself, and she does a lot of things right in Natural History, published in 2003 (the same year I graduated from high school, cut my hair super-short and dyed it red, and was last able to fit into size 3 jeans). Natural History is a space opera, though it's fairly different from the other space opera in our Challenge, Revelation Space by Alastair Reynolds. For one thing, it's shorter, which means Robson has to fit a whole lot of science, politics, and (of course) history into just a few pages. Her brevity likely makes some readers happy and grateful that they don't have to wade through miles of scientific jargon, but it could frustrate those who like a little more explanation. I'm not saying I wish the book were 300 pages longer, but I did find some plot points and characters' decisions a little too pat, and was annoyed by some ends left loose. It is pretty awesome, though, that the two most highly developed characters are female, and arguably both are minorities. Voyager Isol is one of the Forged, half-machine and half-human, basically a sentient spaceship equipped to travel massive interstellar distances with just her own body. Because all her mechanical spaceship parts are like organs of her body, the opening scene in which she is damaged by flying debris is fascinating—she feels real pain as her systems shut down and her engine fails. It's a really creative and effective way for Robson to establish that the Forged are human despite their machinelike aspect. Isol is miraculously saved when a mysterious substance bonds with her failing engine and not only heals her, but makes her into a super-spacecraft that can travel anywhere in the universe instantly. No longer in her death throes, she explores a nearby Earthlike planet that looks like it once supported life. Isol returns to Earth, intent upon making the new planet a home and refuge for the Forged—a place where they won't be beholden to their human creators, where they will be able to live freely and make their own choices. People back on Earth, human and Forged alike, aren't sure Isol is telling the truth about this new planet and want to proceed with caution. So they recruit professor of archaeology Zephyr Duquesne, a woman of color and fully human, to accompany Isol back to the mysterious planet for some exploration and analysis. I found Zephyr to be the most interesting and relatable character in the novel. She's out of her element and intimidated by space travel, but her fascination with extinct cultures is too strong for her to resist the opportunity. Who used to live on this faraway planet? And more importantly, what happened to them, that they left seemingly without a trace? In addition to the Isol/Zephyr storyline, Robson includes sections that follow a strange guy named Corvax, who spends a lot of time in a dreamlike virtual reality, and several other political figures, both human and Forged. Maybe it's because I'm still not a seasoned sci-fi reader, but I found these sections a bit tedious and murky, and wasn't entirely sure what I was supposed to get out of them. I was always glad to get back to a chapter that followed Isol and Zephyr. As always, I welcome your comments here or on Goodreads or Facebook. 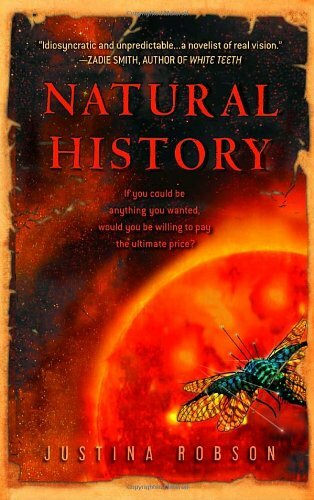 What did you think of Natural History? Did you get more out of the side plots than I did?